Wine of France. Esprit des Trois Pierres is made from the classic combination of selected Grenache, Syrah and Mourvèdre grapes. The grapes are harvested at optimum ripeness from the old vines whose roots enjoy the unique terroir of the region, which is made up of small round pebbles called galets. 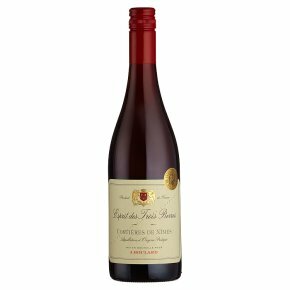 Blackberry and plum fruit flavours dominate, with a subtle twist of spice and pepper, delivering a rich and smooth Costières de Nîmes for a host of occasions. Perfect with casseroles, medium-flavoured dishes or the regional goats cheese Pélardon. Serve at room temperature.